I hate training indoors: the monotony, the sweating, the clutter of the equipment in my loft apartment. But I hate riding in the cold and rain even more. So as the Pacific NW lumbers into the dark days of winter, I sold off my old Blackburn trainer to make way for a set of Elite rollers. Rollers can enhance your pedaling technique as well as give you a proper workout. Many people talk about how humourous it is to fall while riding rollers, but the truth is that crashing in your own living room is really annoying. Certainly not a turn-on for indoor training. Rollers require better than moderate skill, but you don’t need to be a pro to ride them. Yet inattentiveness can lead to a spill if your front wheel drifts past the end of the roller. Elite’s unique “parabolic” rollers flare to a larger diameter on either end. The roller design won’t absolutely prevent you from coming off, but it gives you some tactile feedback from your wheels to tell you that you’re getting too loose with your bike handling. So long as you don’t spazz out and over-correct, you’ll find that you can ride Elite rollers without hyper vigilance. 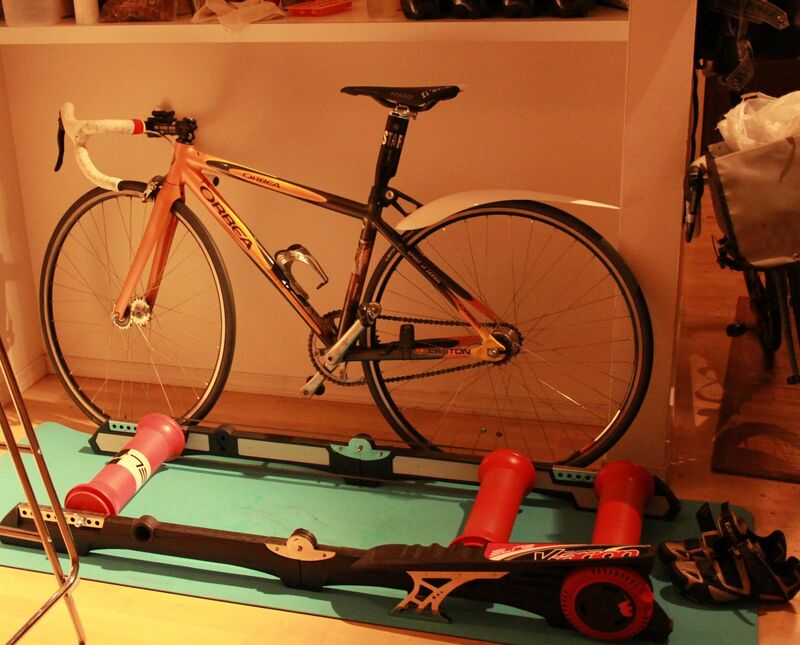 You can relax, but you can’t forget that you’re on rollers. The larger the diameter of roller, the lower the rolling resistance. At 85mm, the Elite rollers are bigger than product like Kreitler’s 2.25” (57mm) mini-rollers that rely entirely on the rollers diameter to generate resistance. Instead, the Elite V-Arion uses a 3-level magnetic resistance unit integrated into the plastic frame. This is one of the primary reasons I was attracted to the Elite model, because older rollers normally had to clumsily bolt on a mag unit. I wanted to be able to quickly and conveniently stash the rollers when I’m done using them, and the V-Arion does this handsomely. And while the plastic frame might strike many as being a little cheesy compared to those frames made of metal, keep in mind that the plastic frame is less likely to scratch furniture and hardwood floors and features a convenient mounting step. The plastic also helps to dampen the noise and vibration somewhat. On the other hand, the plastic frame has no grip where it contacts the floor, so forget about using these directly on a wood floor because the roller frame can move about precariously as you mount or shift your weight while riding. I bought an extra long padded yoga mat to place under the roller when I work out. The mat has the added benefit of preventing my sweat from pooling directly on the floor. In use, the Elite rollers have a bit less vibration than other rollers I have used, and the manually controlled resistance unit functions as follows: off/ light resistance/ pretty stiff. And when I’m done the folded up V-Arion has a relatively small footprint and doesn’t fall over. The $409 V-Arion is actually last year’s model. The new $400 Arion Mag has all the same features in a slightly refined frame, but you can get the V-Arion on clearance for $260 while supplies last. Also new this year is the Arion Digital, which has a wireless remote control for the resistance (w/ 16 levels) integrated into an ANT+ compatible cyclo-computer. You can even program in workouts. The Arion Digital Rollers retail for $840.